When you think about braces, what’s the picture you see in your mind? Chances are it involves shiny metal brackets, complicated wires, and elastic bands placed in various configurations. It’s easy to think orthodontics is a thoroughly modern affair, particularly when you consider how high-tech it tends to be these days. However, humans have been trying to straighten their smiles for thousands of years. Thanks to archaeological finds and ancient writings, we know those primitive versions of orthodontic treatment, and we do mean primitive – some of the earliest attempts at aligning the teeth and jaws involved extractions, bloodletting, and materials like catgut and crude metals. Even the oldest, bulkiest braces sound better than that! As you can see, Frey Orthodontics is committed to keeping up to date on the techniques and technology that give our patients the best results and the most rewarding orthodontic experience around! But it can still be fun to sit back and take a look back at where it all began. Let’s take a look at what went on in those first few centuries of mankind trying to work out the kinks involved in correcting misaligned teeth and jaws, and how it evolved into orthodontics as it is today! A number of mummies have been found with bands on their teeth, so we can date orthodontics back at least that far. Socrates described Etruscan women using gold bands to preserve the position of the teeth after death, and around about 400 B.C., ancient Greek physician Hippocrates was the first to write about tooth irregularities. Roman writer Celsus took it a few steps further when he actually recommended using fingers to push newly emerging teeth into the proper positions. Oddly enough, there was a pretty long lull in orthodontics after this initial period, and it wasn’t until the 18th century that interest was reignited. New interest in this time period resulted in a flurry of development, and there were plenty of trials and errors on the way to any orthodontic techniques we’d recognize today. One example is the invention of the bandeau, which French dentist Pierre Fauchard wrote about using in 1728. The bandeau was a horseshoe-shaped piece of metal that was placed outside the teeth. String or wire was then used to tie the teeth to the arch. The basics of the bandeau were similar to modern braces, in that it also relied on slow, steady pressure delivered over time to move teeth, but it didn’t allow for any adjustments, which made it difficult to move individual teeth in different directions. Fauchard is also known for the “pelican,” a set of forceps he used in operations with patients to forcibly realign the teeth. He would then tie adjacent teeth together in order to hold them in place while they healed. Your adjustment appointments don’t look so bad now, right? However basic its design, the bandeau continued to be used up until about 1819, when Christophe-François Delabarre developed the wire crib. This appliance was usually made of metal wires that had been bent and soldered together to form the “cage” that fit tightly over and around the teeth. Strings or metal springs could then be attached and used to apply the constant force to teeth, moving them into better positions gradually. The wire crib worked in much the same way our current braces and aligners do, and its invention is generally regarded as heralding the birth of contemporary orthodontics. In fact, it’s the precursor to many of the appliances we use even now! Edward Hartley Angle is another early orthodontist whose influence is still felt today. He is widely considered to be the “Father of Modern Orthodontics,” thanks to his identification of the true properties of malocclusions, or misalignments, of the teeth and jaws in about 1880. Here in the United States, it took until the early 1800’s to finally see some significant orthodontic contributions. One such contribution was the “occipital anchorage.” Developed by J.S. Gunnell in 1822, this was an early form of headgear that fastened to the jaw from the outside of the mouth and exerted gentle pressure on the teeth. Charles Goodyear invented vulcanized rubber in 1839, and within a few years, American dentist E.G. Tucker was the first to use it in orthodontic appliances. “The Dental Art,” the first classic book on dentistry, was written and published by Chapin A. Harris in 1840. In the book, he outlined a number of practices that were seen as quite innovative for the time, such as soldering knobs on bands to assist with tooth rotation and applying gold caps to molars to open the dental bite. Dentists continued making enormous strides in understanding how the teeth and jaws work over the next century, but braces themselves remained more or less unchanged. They were often made from materials like gold, platinum, silver, steel, gum rubber, and vulcanite, but some of the earliest orthodontists would utilize ivory, zinc, copper, brass, or even wood instead. In the 1970’s, stainless steel began to replace gold and silver as the most popular choice for wires thanks to its shapeability. This is about the same time that dental adhesives were invented, allowing orthodontists to stick brackets to the surface of the teeth rather than winding wires around each tooth to anchor the brackets as they had been doing up to that point. These developments significantly reduced the cost of braces, broadening their appeal and making them much more widely available. Taking a look back through orthodontic history shows us that us humans have been striving for centuries to create attractive, healthy, functional smiles. Teeth and jaws that are properly aligned are as important now as they were in the days of pelicans and bandeaus! 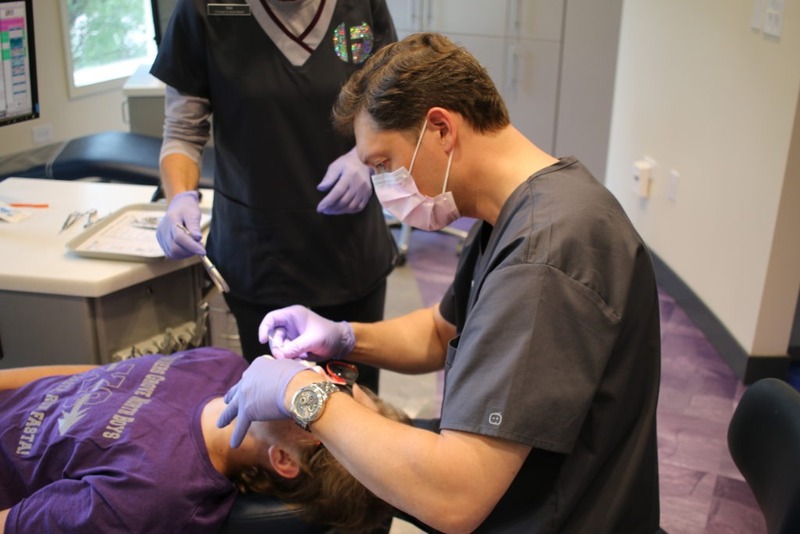 Frey Orthodontics is proud to be part of such an established tradition of not only creating beautiful smiles for our patients, but improving your overall oral health as well. For more information on all the ways, modern orthodontics can benefit you and your family, get in touch with us today to schedule a consultation at our Algonquin or Naperville offices.